In addition to being the largest organ of the human body, the skin is also one of the most sensitive because it is exposed to all external factors. We seldom care for our skin with the love and consideration it truly deserves. Today we want to show you how to identify and prevent skin cancer based on a series of simple guidelines. Know below and in detail, how to be alert and prevent skin cancer. Moles, spots and other disorders of the skin, although they are usually quite common, may also be alert to some serious condition, such as melanomas , the most dangerous form of skin cancer. The Skin Cancer Foundation informs us that every 57 minutes, a person dies of melanomas in the world. And if you’ve had more than five sunburns in your life, your chances of developing the disease are even greater. See below, what are the guidelines to follow to identify and prevent skin cancer. Common, benign moles are usually symmetrical and regular. The melanomas are shown and larger, irregular, almost shapeless. -The edges of the common moles are soft and well defined. -The edges of the melanomas are blurred and almost without form. -Generally benign moles have a specific and consistent color. 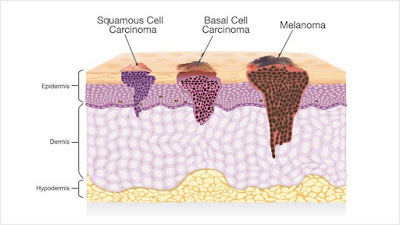 -Melanomas are characterized by their diversity in colors and shades. -It is important to note that the uneven distribution of color in a mole can be a clear sign of a cancerous spot. -A benign mole usually has no diameter more than 6mm. -A mole with a larger diameter could be dangerous. -Common moles often change shape and appearance. -Melanomas can be characterized by their changing appearance over time. What to do to take care of our skin and prevent skin cancer? Here are a number of important tips and tips to keep in mind when it comes to preventing skin cancer. Pay close attention to every mole that appears in your body!